Top Five Reasons to Book a Riding Holiday as a Solo Traveller. In our latest blog post, In The Saddle’s Claire Douglas gives us her Top Five Reasons to Book a Riding Holiday as a Solo Traveller. 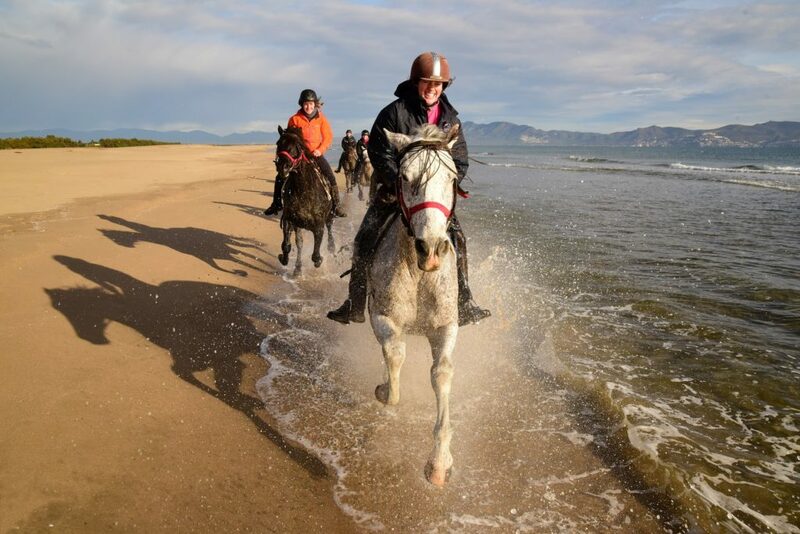 This is me cantering along the surf in north eastern Spain. As a travel consultant with In The Saddle part of my job is to visit the destinations and check out the rides. I travel on my own and I love the experience so I wanted to share what makes it special. Five Reasons to Book a Riding Holiday on your own. People travel alone for all kinds of reasons. We have busy lives – it may be difficult to schedule time off work together, or some people simply prefer it. Why miss out on the opportunity to go on an amazing adventure or visit the country of your dreams just because it doesn’t suit your nearest and dearest or you don’t have someone who shares your interests? Think of the amazing people you will meet, things you will see and horses you will ride. Not to mention the lifelong memories that you will create. Don’t worry, you won’t be alone for long – you will soon join a group of like-minded individuals, all with a passion for horses and travelling. You can choose to socialise as much or as little as you like and there is always the option of chilling out in your own space with a good book if you need some quiet time. As the week progresses, you will get to know your fellow riders. Trail rides are especially good for this as you are moving on each night to a new place. Riding together is a great bonding experience as you get to know your fellow travellers along the way. It’s great to catch up around the dinner table after a day in the saddle. Riders often remain in touch and continue to travel together afterwards. Don’t worry about finding your way through a strange airport. You will be met in Arrivals and transferred to the ride, often getting to know your fellow riders on the journey. The phrase “single supplement” can deter solo travellers. However on many of our holidays if you are “willing to share” then there is no supplement and on others you will have your own room without paying any extra. Since most of your time is spent in the great outdoors on horseback it’s fine to share a room just to crash out at the end of the day. You might even become great friends. So our message is to go for it; travelling alone is a liberating and rewarding experience ………. especially if it’s in the saddle!